To Cite: JAGADISHKUMAR K , G. Manjunath V, Rashmi N, Mamatha S. Accidental Levothyroxine Ingestion in a Child, Iran J Pediatr. 2013 ; 23(6):711-712. Hypothyroidism is one of the most common endocrine disorders, and many levothyroxine prescriptions are written to replace the hormone deficit. Herewith we report a thyroid hormone overdose in a 6 year old boy. 6 year old Beckwith-Wiedeman syndrome boy with developmental delay presented with accidental ingestion of 2.5 mg of levothyroxine 6 hours prior to admission. He has been receiving levothyroxine for hypothyroidism since neonatal period and currently (weight=17 kgs) he was on 100 μg of levothyroxine once a day. There were no tremors, irritability, convulsions or diarrhea. On examination his temperature was 98.6áµF, pulse rate 100/min, RR 20/min and BP was 100/60 mm Hg. Other systems examination was unremarkable. His Thyroid profile is shown in Table 1. Gastric lavage and gastrointestinal decontamination was done. His complete blood count, blood sugar, blood urea, serum creatinine, Aspartate transaminase (SGOT), lactate dehydrogenase (LDH), creatine kinase MB (CK-MB) and electrocardiography were within normal limits. He was monitored for overdose features. After 24 hours he was tachycardic (PR 120/min), febrile (99.60F) with blood pressure 112/80mm Hg (>95th centile) along with sweating of palms and soles. In view of tachycardia, sweating and hypertension, Propranolol and Dexamethasone was started. After 76 hours features of thyroid toxicity subsided and drugs were tapered. Child was restarted on thyroxine and discharged on 8thday. Child was followed up at 3 and 6 months, there was no feature of hypothyroidism. and hypertension. Annual report of the American Association of Poison Control Centers' National Poison Data System of 2008 revealed that out of 9,006 unique exposures to thyroid preparations only 3 cases had major adverse outcome and there were no deaths. 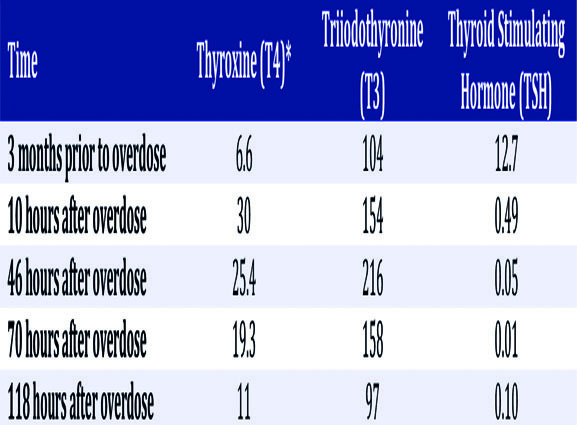 It has been documented that there is no correlation between the amount of levothyroxine ingested and the onset and severity of the symptoms as well as the serum concentrations of both triiodothyronine (T3) and thyroxine (T4)[2,5-7]. In study by Golighty et al one child with massive ingestion (13mg) never developed any complications whereas ingestion of 1.8mg developed tachycardia. Serum T4 levels can help only in verifying the occurrence of the ingestion[5,6]. In many pediatric levothyroxine ingestion study series either they did not develop symptoms or showed only minimal symptoms[2,3-6]. In a study by Livotiz et al only four out of 78 children developed symptoms and T4 levels in three of these four children were 32.8, 30 and 26.4 μg/dl, respectively which were similar to T4 levels in our child. Literature has supported a conservative management based on minimal symptoms[2,5,6]. T4 values cannot be used to guide treatment, and prompt clinical monitoring and evaluation is necessary. Propranolol is used in the presence of features of toxicity[3,5]. Julio Pardo opines thyroxine overdose needs very close monitoring after gastrointestinal decontamination and conser-vative treatment like propranolol, prednisone, etc should be started as soon as the patient becomes symp-tomatic to avoid the development of a thyroid storm. In children with overdosage of levothyroxine, there is production of reverse T3 which is inactive, thereby protecting from the toxicity and this pathway is enhanced by steroids supporting addition of steroids to the treatment regimen[3,8]. To conclude although pediatric levothyroxine overdose rarely leads to serious toxicity, any symptoms should be managed accordingly as they arise.